KATHMANDU, April 14: The government Sunday announced the national campaign for health insurance of senior citizens and the opening of bank accounts of all Nepali citizens on the occasion of the Nepali New Year 2076 BS. Prime Minister KP Sharma Oli inaugurated the campaign amidst the presence of several senior citizens at National City Hall, Kathmandu. The theme of the campaign is ‘health insurance of senior citizens, connect it with prosperity and bank accounts of all Nepali’. 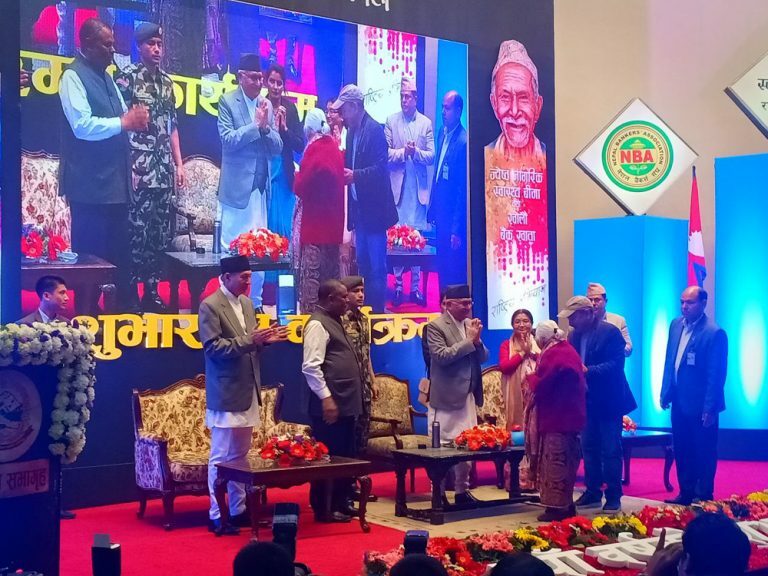 The government announced a health insurance scheme of up to Rs 100 thousand for senior citizens at a program jointly organized by the Office of the Prime Minister and Council of Ministers; Health Insurance Board; Nepal Rastra Bank and Nepal Bankers’ Association. The government has decided to pay itself a premium for the scheme. Presently, 713 local levels, out of 753, have access to institutional financial services and it will be extended to the entire levels by the end of the current fiscal year.